IT WAS CONDUCTED ON 12 RABI UL AWWAL 1435 H, FROM 12 PM TO 12 AM (GMT+5). 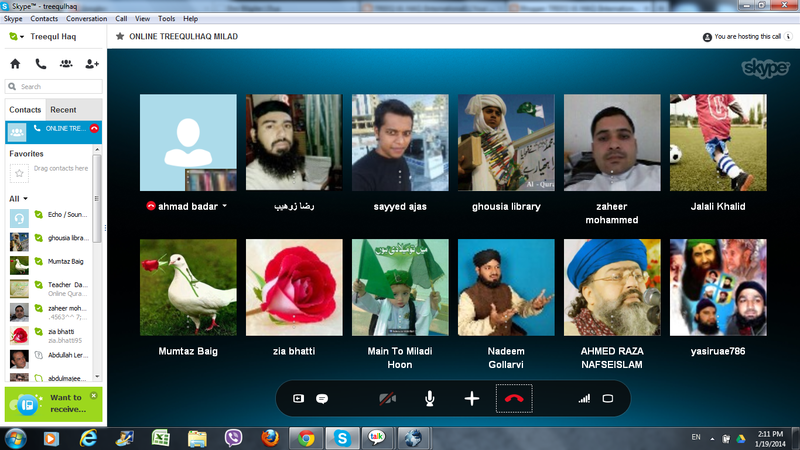 IT WAS FIRST EVER ONLINE INTERNATIONAL MAWLID / MILAD ARRANGED BY TREEQULHAQ. SUCH TYPE OF MILAD HAS NEVER BEEN LISTENED BEFORE. IT IS BIDAH HASANAH INVENTED BY TREEQULHAQ. 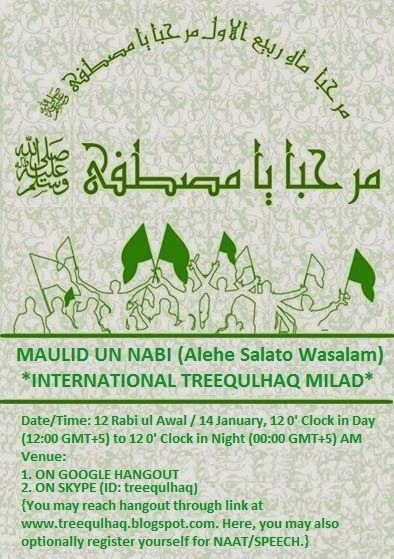 TREEQULHAQ HAS UNIQUE HONOUR TO ARRANGE/INVENT ONLINE MILAD IN WHICH PARTICIPANTS FROM VARIOUS COUNTRIES PRTICIPATED ESPECIALLY HARAMAIN TAYYEBAIN. HUMZA FROM MADINA WAS VERY NEAR TO SACRED GREEN TOMB AND VIEWING IT DURING MILAD. HAMZA IS NOW MEMBER TREEQULHAQ. SIMILAR REMARKS WERE GIVEN BY ZAHEER FROM MAKKAH. MUMTAZ FROM CRAWLEY UK ALSO TOLD THAT SUCH MILAD IS REQUIRED VERY MUCH FOR FOREIGNERS. AT THE END OF INTERNATIONAL TREEQULHAQ MILAD, PARTICIPANTS DECIDED THAT WEEKLY MEELAD ON EVERY THURSDAY 9 TO 11 WILL BE REGULARLY HELD INSHAA ALLAH.